Welcome to our now monthly Sewing 101 Feature! Today Ashleigh from Bee in Our Bonnet is sharing her tips for making amazing (yet simple) projects with felt. I am really excited to be chatting with all of you at Pickup Some Creativity! Sewing 101 has been so fantastic! I decided to talk about sewing with felt today. I think felt projects are perfect for beginners because felt is so NOT INTIMIDATING! I just figure if I mess up, it's so cheap to buy more! 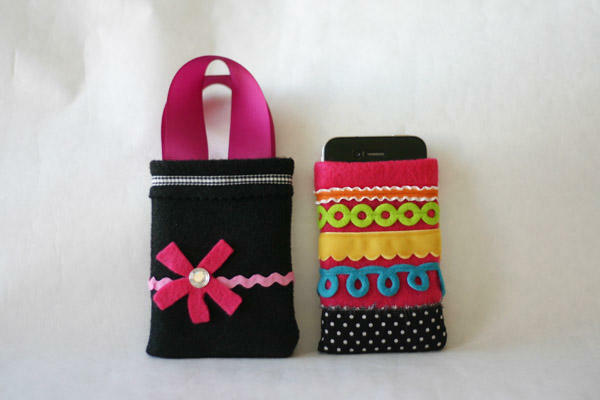 I made these little ipod/phone purses with a group of teenagers. Felt is so easy to pin and send through the sewing machine. It was a great way for the beginning seamstresses to get a feel for the sewing machine. Home Décor is a cinch with felt. 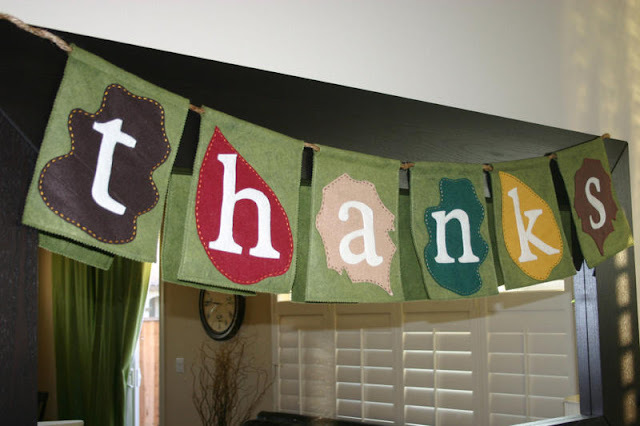 My sister and I made these Fall banners last year. And since Halloween is coming around, you should consider using felt for your homemade costumes. Pottery Barn Kids and Pottery Barn Teen use simple felt for many of their costumes. (with tons of fabric left over)! My patternless way of doing this costume was to make a dress with pink on top and brown at the bottom. (The skirt was smaller on the bottom than on the top). The cupcake wrapper was just another layer of felt cut in a big circle. then sewed it up with vertical lines. Then I made two scalloped layers of "frosting with polka-dot sprinkles." My favorite part was the hair accessory. 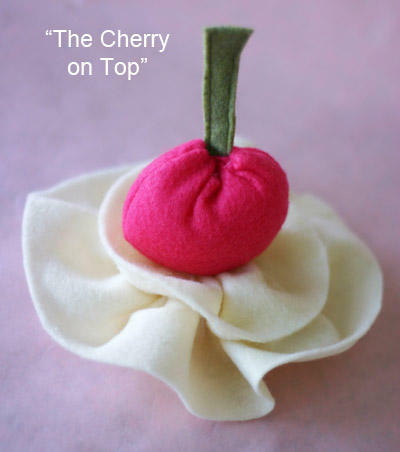 I took a small venture into the felt food craze and it was so fun. I think it could be very addicting to make play foods galore with felt. I love to use clear thread with felt, because I'm lazy about changing thread from color to color. 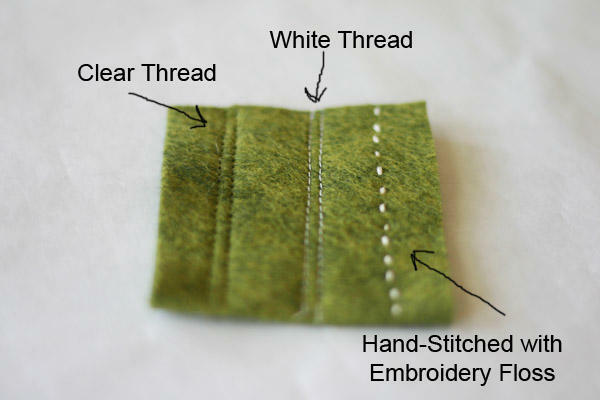 If you want the thread to be decorative and really show up, you'll want to hand stitch. Here's an example of how the thread shows up on felt. - Felt is very inexpensive! - It is available in many colors. - You can cut felt in any direction, it is very forgiving. - Felt does not hold up as well with multiple washings. If you plan on washing the item a lot, you might want to consider using another fabric. 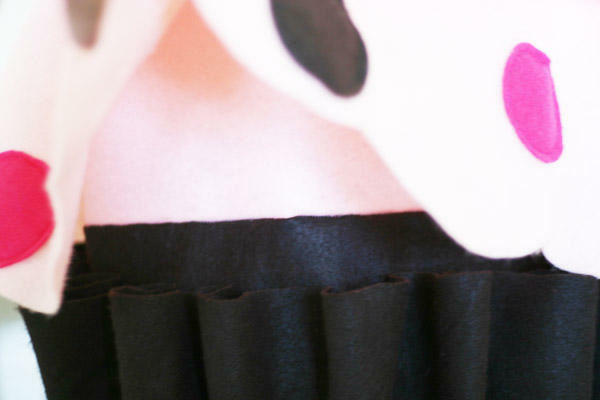 - Picking out seams is a little harder with felt, but still do-able. Use the razor blade method that Jessica taught us! - Since felt is a pressed (and not woven) fabric, it can be pulled out of shape if you’re not careful. Acrylic felt is more inexpensive and readily available. Acrylic is thinner, wool is generally thicker. Wool has a softer, smoother feel, but could possible be an allergy issue. Wool felt shrinks A LOT when you wash it. Wool felt cuts with less fly away fibers. Wool felt is stronger and less likely to be pulled out of shape. -Your local craft/fabric store will have it in small sheets for crafts and by the yard for bigger projects. Wool felt is a little bit harder to find. Online stores and many etsy shops have a large variety of wool felts. I hope this encourages everyone to reach for the felt and run it through the machine! I’m sure you’ll end up with something great! Are you just drying over that amazing cupcake costume??? Sewing with felt is how I was introduced to sewing. Jump in and try it! I really like this feature. That "thanks" banner is beautiful and so is the costume, what a cutie! Thank you so much for sharing her talents, Chris. I just found your blog searching 'homemade cupcake costumes' online. 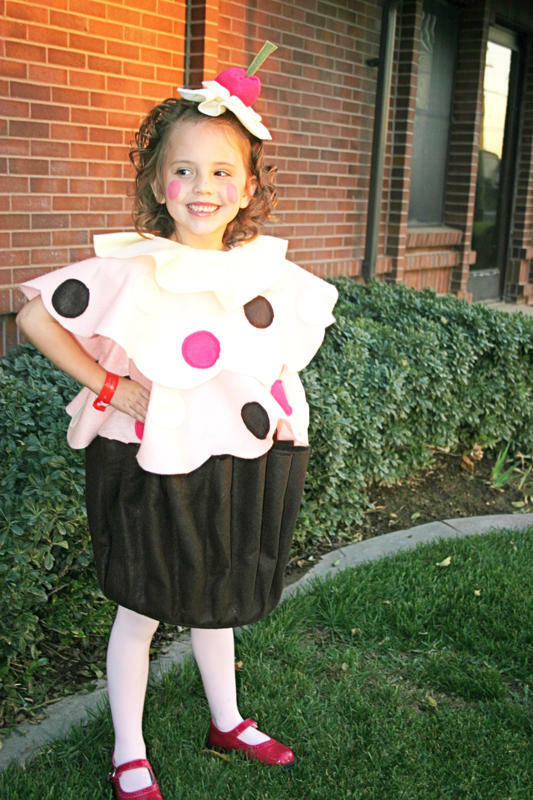 My daughter wants to be a cupcake, and this was only one she liked! I LOVE it, and your blog! I'm not much a sewer, but I am definitely going to try my hand at this adorable costume. When you used clear thread on felt, did you also use in the bobbin? I have yet to master that! Any tips and types of clear thread that worked well?